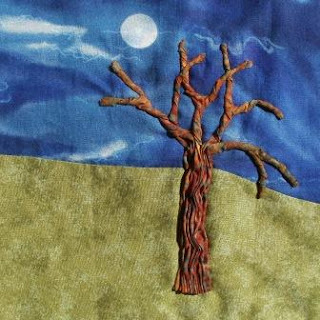 Last week I shared the beginning of the front side of the cover for my fabric book Trees. This week I appliquéd the background. Then I could appliqué the tree to the background. The trunk is ruched, the branches are twisted. I used batik for my tree, because it doesn’t fray much. Now I have to think how to add leaves. Take a closer look at my tree here. More info about Work In Progress Wednesday at Pin Tangle. Wow, dat heb je mooi gemaakt. Goed bedacht om die stof zo de plooien en draaien. Dat maakt de boom meteen heel realistisch. I love how you have done the tree trunk! WOW! That moonlit background is striking and the tree is just fabulous! You have managed to get just the perfect structure. Looking forward to the tree sprouting leaves!